Do surgical implants attract lightning? My friend had a huge operation to correct double scolliosis and i have spent considerable time helping her recover. The operation involved fusing a titanium rod to her spine, to replace but not remove an old surgical steel one. I have nicknamed her the lightning rod as she is petrified to go out in the lightning. Two questions; firstly is she more likely to attract a lightning strike? Secondly, could the metals in some way have an effect on radio signals as at times she appears to effect radios and mobiles just by being in close proximity to them or is this just coincidence? Dave - The answer is yes, but only a very, very little bit. Okay, lightning is very, very highly charged. This charge will attempt to flow down to the ground. The problem is air is an insulator so it's got to flow through something. The way you can get electricity to flow through air, so that the voltage gets big enough, is if the electric field gets big enough, you can rip electrons off the air, they can then fly through the air and bash other electrons off. You've got a big conducting path which electricity can flow down. It's a bit like a wire and the lightning bolt can go down through this path. The air gets very hot, and you get thunder and lightning. The shorter this path has to be, the better the conductivity route up before the lightning has to start, the easier it is for lightning to form. Lightning tends to strike the lightning rod before it will strike something below the lightning rod because it is an easy path to get to Earth. So you're friend would be an ever so slightly better route for the lightning to go than you are because she's got this big metal rod down her back. Actually, compared to air, you're a very, very good path, so it's going to be a trivial difference and if she actually had a big sharp, pointy thing coming out of the top of her head, that might have more of an effect but I very much doubt that she has. Chris - Because lightning conductors don't actually protect a building by attracting lightning. 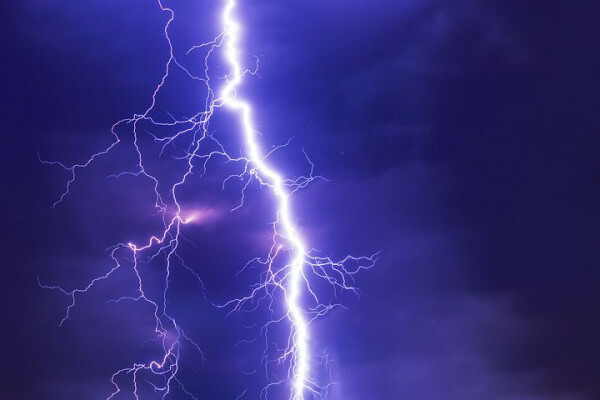 They actually deflect the lightning around the building by effectively creating a sort of shield or coronal discharge of electrons flowing around the building and that provides a lower resistance route to ground for the lightning. Dave - Yeah, they do two things. One of them is that they are a good path. If lightning is going to hit the building, it'll hit the lightning rods, and therefore, the building will not catch fire, and the second one is that they can essentially discharge the lightning in that general area, they discharge and so it's less likely to strike in that area. But the radio thing I think is quite likely because essentially, she does have a great big piece of metal in her back, a big piece of metal that acts like an aerial and can reflect radio waves, and do all sorts of strange things to it, in the same ways you can to a slightly lesser extent. So yes, I'm sure she does affect that. Chris - Don't let her come around my house then because I have a terrible job picking up anything where I live. Dave - She might improve it. Chris - She may improve it even? Oh well, okay then I'll plug her in. Previous Will gritted roads hurt wildlife? Next Do large eyes see better than small ones?